Spotify trials Premium Duo subscription for two | What Hi-Fi? Spotify is trialling a new subscription tier in Europe. 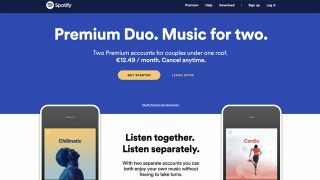 Spotify Premium Duo gives two people living under one roof Premium accounts for a total of €12.49/month - a €7.51 monthly saving over paying for two €9.99/month Premium accounts individually. Nifty. Existing Spotify Premium subscribers wishing to go Duo can do so and keep their music, recommendations and playlists. They simply have to log-in and invite someone they live with (both users of the two accounts must live at the same address) to join Duo via email or WhatsApp. For the uninitiated, Spotify Premium offers unlimited access to the service's catalogue, with the added benefits of an ad-free experience, improved 320kbps streams, downloads for offline listening, unlimited track skipping and Spotify Connect, which allows Premium subscribers to stream its catalogue directly to speakers, TV or stereos with a touch of a button. The Premium Duo subscription has popped up on Spotify's EU page, but there's currently no sign of it on its UK or US sites.